The best picture category nominations are as follows. No Country for Old Men, There Will Be Blood (eight each). Michael Clayton, Atonement (each with seven), and Juno (four). This list of serious and dark films is a reflection of what we have been living this past year. With the wars in Iraq and Afghanistan droning on, the sub-prime housing bust shaking the economy (no lessons learned there), a critical presidential election now in full swing, and global warming pushing uncomfortably into our protected cocoon; it’s no wonder we’re feeling a little down. The entertainment business can add one more to that list, the Writers Guild of America strike. But the news isn’t all bad. Depends on your perspective. This slate of pictures is top shelf. Great acting, strong writing, meaningful stories, even an Independent in the bunch. Drama has made a comeback and pushed special effects to the side. Hooray! As a film enthusiast there’s lots to chew on here, and I continue to maintain that the darker side is so much more interesting. The big question is will the Writer’s strike be settled in time? If not, will they work out a way for the Writers to actually write the show while on strike? The lead in banter given the presenters is trite enough when written by actual writers. Can you imagine what we might have to endure if amateurs are brought in? But we’ve got Jon Stewart as host, so it will be entertaining.Go here to get a printer friendly version of all the nominations. 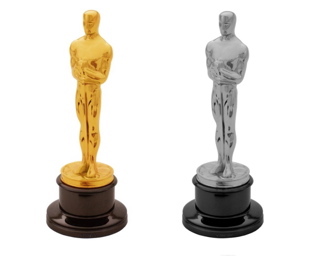 Visit the official Oscar site.